The first edition, now called Classic Traveller, featured many original touches. It expressed character ability ratings in hexadecimal (base 16) notation. The character creation system produced player characters who started play as seasoned veterans, often skilled in, and scarred from, several professions. Though jocular commentators have always derided Classic Trav's char-gen for allowing a small chance the character could die even before starting play, this alleged flaw (removed in all later editions) highlights one of the game's neglected virtues. The risk of death, along with the many decisions about career paths, made character creation a little solitaire game in itself. Many Traveller rules systems rewarded solitaire play; you could have a great time just generating ships or star systems, or make and lose fortunes shipping cargo between worlds, all without a gamemaster. This rare quality derived from Miller's inspirations, which differed from that of the creators of Dungeons & Dragons. D&D's roots lie in military miniatures. Though it adopts many D&D design ideas, Traveller also draws deeply from a different wellspring, hex-grid wargames, where solitaire play is common. That ancestry also influenced the game's setting, an array of star-spanning polities warring for resources and influence across vast reaches of space. "I'll confess that was an awakening for me, and I realized I couldn't make this game all things to all players; I had to choose. Our reasoned corporate choice was to provide background and adventures for those who lacked the spare time to make up their own." Elaborating on the setting Miller originated in the wargame Imperium, he and other designers - Chadwick, Loren Wiseman, William and Andrew Keith, and many more - drew inspiration from respected science fiction writers (Poul Anderson, H. Beam Piper, E. C. Tubb's Dumarest of Terra series) along with, as Traveller writer Loren Wiseman has put it, "a little Roman Empire, a little Star Wars, a lot of snippets of this and that from history and literature, all melded together." Unusually among early RPGs, Classic Traveller made explicit some of its setting's baseline assumptions and requirements - for instance, interstellar communication is limited by the speed of travel. 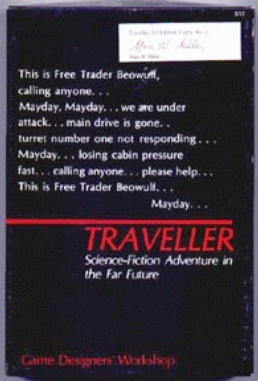 The Traveller support line articulated one of the earliest adventure design patterns, a plot description using five narrative elements: the Enigma (the lure that draws the player characters into the adventure), the Push (their motive for escaping their current circumstances), the Pull (the reward they expect), the Gimmick (the, uh, gimmick) and the Twist (a narrative surprise). But the Classic books gave little hint about the nature of these elements or what the designers expected PCs to do. A 1980 collection of mini-adventures, 76 Patrons, provided an eye-opening hint: Most of its mission-givers were crooks hiring the PCs to commit theft, espionage, kidnapping and murder. Other supplements introduced many legitimate professions, such as mercenaries and planetary scouts. Few roleplaying campaign settings betray any sense of the designer's personal politics. Though some of his source materials (notably Poul Anderson's Polesotechnic League stories) express overt political ideas, Miller took a more low-key approach. Nonetheless, "The Traveller universe of the future was indeed reflective of my own personal politics," he says. "One of the important phrases in character generation (written back in 1977) was an admonition that characters could be any gender or any race. Today it's a no-brainer that a character can be a woman rather than a man; back then, I thought it was a no-brainer as well, but I heard plenty of approving feedback for saying it explicitly." Miller expressed a similar idea with the Imperium's Major and Minor Races. "The Traveller universe chronicled six Major Races that dominated charted space, and lots of minor races that were inferior in influence or power. The game spent three or four years detailing this institutionalized racism throughout the universe, and then began to show the fallacies of the concept. We showed there wasn't even firm agreement on which Six Races were members of the Major Race concept. Then we revealed that one of the Major Races (the Aslan) didn't meet the criteria we had previously stated. "So we were showing an institutionalized racism as part of the all-pervasive culture of the future, and getting players to buy into it as part of this fictional universe, and after they did, tearing it down and showing its flaws."